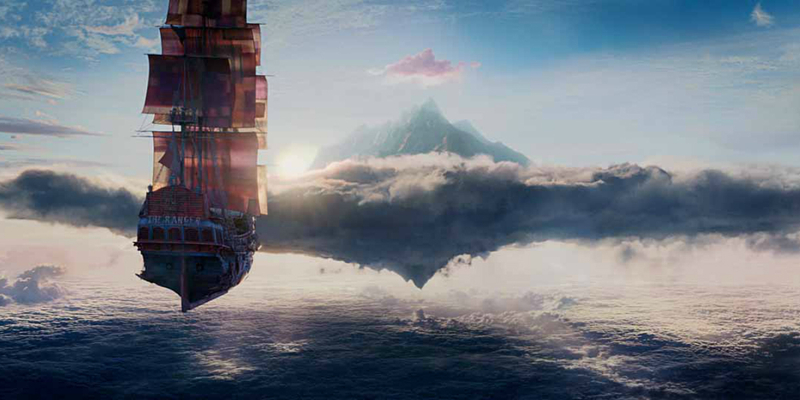 There’s obvious hesitation to Joe Wright’s new film Pan. It’s the latest in a slew of remakes, sequels, prequels and reimaginings of old classics and adored children’s stories that seem to be saturating every cinema across the world right now. But fortunately the film’s originality and spin on the origins of Peter Pan are refreshing and new, given that films about Peter and Wendy have long been overdone and should rest for a few years yet. Opening in a Wicked-esque way, emphasising the importance of understanding the beginning of a story when all you know is the end, Pan opens with Peter (Levi Miller), abandoned by his mother (Amanda Seyfried) as a baby, growing up in a London orphanage during the Second World War. Strangely (and unexplained) the head nun of the establishment is working with intergalactic pirates who steal away a number of orphaned boys on a flying boat and travel onwards and upwards towards Neverland. Once in Neverland, all the orphaned boys are made to work in the mines, desperately seeking fairydust under the cruel and crazy leadership of head pirate Blackbeard (Hugh Jackman). Here Peter meets fellow worker James Hook (Garret Hedlund) with whom he plans an escape plan back to Earth, which is botched, landing them in trouble with the Neverland natives, including Princess Tiger Lilly (Rooney Mara). Soon they all band together to lead a revolution against the pirates and fight for a harmonious Neverland. The first big screen appearance of Peter since 2003’s live action Peter Pan, this prequel is both directed at children but has something for older audiences too. In fact there are lots of easter eggs for long time fans, with references to Neverland’s snapping crocodiles, an appearance from the famous mermaids (in a bizarre cameo by Cara Delevingne) and talks about the lost boys. Pan is a strange film for Joe Wright to be directing, with his more famous renditions of Pride And Prejudice and Anna Karenina and his Academy Award-nominated Atonement, but his close attention to detail, excellent colour palette and bright costuming and design make it dazzling to watch, though this is somewhat lost in 3D screenings of the film. Screenwriter Jason Fuchs does his best to build a history to a story that is one of the most well known in the world, but leaves some unanswered questions and (spoiler!) doesn’t explain how Hook and Peter eventually become enemies, which is what many audience members waited for. Fuchs ultimately captures the essence of the Peter Pan narratives but is a little too earnest in his exploration of the story, wit the film likely to scare young children while appealing older audiences who are more familiar with the story. Miller is really excellent as Peter, which is important to be able to carry the rest of the story. His acting is nuanced and he seems very comfortable in front of the camera. Jackman’s and Hedlund’s characters are more cartoonish and flamboyant than Peter Pan (with Jackman in particular evoking much of Johnny Depp’s past auras), which makes for interesting chemistry between the characters, bordering on both serious and fun. Mara is good in her role, though the question still remains why a character as distinctive as Tiger Lily wasn’t given to a Native American, when Mara is very much out of place among the other Neverland native members and looks odd in the “traditional” dress. It’s a shame that such an irresponsible casting choice like this overshadows the story and that a Native American actress wasn’t given an opportunity to show off her skills. Indeed, sadly many of the characters are one-dimensional and lack much intrigue. Towards the end the story loses some momentum and Pan suffers from an intensive mythology and backstory that is too complex at times, rather than just focusing on the fun and magic of Neverland. It’s an enjoyable journey at times and on the better side of the spectrum of recent remakes and prequel; it doesn’t mean it’s an excellent film, but does what it is meant to – be fun for children and likeable for adults. Originally published in The Australia Times, 3 November, 2015.